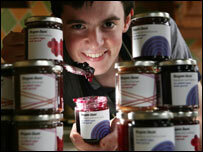 An Edinburgh teenager has become one of the youngest people to supply a UK supermarket after securing a "jammy" deal. 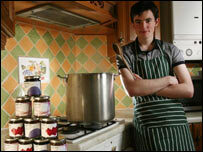 Fraser Doherty, 18, has created a range of "super jams" which will be available in 130 Waitrose stores across the UK from March. His recipe uses grape juice to sweeten the fruit instead of refined sugar or artificial sweeteners. He began making jam when he was 14, using his grandmother's secret recipes. Fraser then added his own ingredients and developed the range to include a "super food" in each jam - foods naturally rich in a range of nutrients that can have a beneficial effect on health. Have your say: Do you have a recipe for success? In just over a year his jams had proved to be so popular that he was cooking up to 1,000 jars a week from his parents' kitchen. He was soon selling out at farmers' markets and supplying delicatessens across Scotland. Fraser took his healthier fruit spreads to one of Waitrose's regular "Meet the Buyer" events where the supermarket felt that the jams had the potential for a larger market. He said: "When I was 14, my gran showed me how to make jam with her top secret recipe. "I decided to make the leap from making jam in my kitchen to making it in a commercial setting. "I met with Waitrose and told them about the idea of making jam without sugar.It's a strange thing to get enthusiastic about but I really love jam." Michael Simpson Jones, Waitrose's preserve buyer, said: "Waitrose has a long history of working with smaller scale suppliers, like Fraser, as it allows us to offer customers real diversity of choice. "I was bowled over by Fraser's passion as a producer, and that a 17-year-old had such strong entrepreneurial skills. "Fraser has managed to take a product that's regarded as old-fashioned and has completely reinvented it, giving it an up-to-date make-over." Fraser said: "I'm hoping that Super Jam will help encourage a new generation of jam-fans, and that it might inspire other young people with a business passion to go for it." Fraser won an Enterprising Young Brit Award at the age of 15 and was later invited to Downing Street and commended by Chancellor Gordon Brown.